We support people living with chronic pain. Integrating pain science, the lived experience of pain, and mindful movement approaches. Pain Care for Life focuses on moving with more ease, while integrating pain science with skillfulness in keeping your body, breath and mind calm. An essential educational and awareness package for those living with pain, Pain Care for Life offers guided practices and knowledge that will make ease of movement successful for you and your goals of recovery. Follow our FREE 5 Steps and these important first steps will guide you towards making moving with ease a reality. Pain self-management is a difficult skill to master. Life Is Now Pain Care products help increase your skills and your knowledge. Use them to find new ways you can move with more ease, to find more calmness, and more joy. They are intended for use with the guidance of your health professional. They will help you succeed outside your health care visits when you are practising at home, and when you don’t have easy access to one-one care. Neil Pearson is a skilled compassionate physical therapist, an engaging expert educator, and a leader in pain management in Canada. Neil attained his licence in Physical Therapy in 1985, and completed a research Master’s degrees in Rehabilitation Science in 1993. His initial university years focused on becoming a physical education teacher - BA-BPHE. Neil completed Phoenix Rising Yoga Therapy training in 2003, and integrates yoga therapy into his clinical work and teaching - CYT. Neil is an experienced yoga teacher - ERYT - focusing his classes on therapeutics, and guiding students to find ease in body, mind and heart. Neil’s education is never-ending, with patients and students being his most influential teachers. - Yoga for People in Pain, chapter in Integrative Pain Management edited by Thompson & Brooks, Handspring Publishers Limited, due late 2015. - Pearson, N, Prosko, S. Overcome Pain, Live Well Again Level 2&3 DVDs. Self published 2014. "I would definitely recommend the Pain Care Yoga course to any physio who works with clients who have pain and I am not a yoga teacher. This course changed my approach after 25 yrs of private orthopedic practice (and I've done a lot of courses). Neils's strategies are based in science and easy to explain to clients. 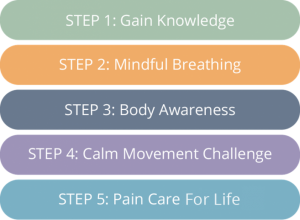 The 5 part pain strategy, breathing and body scan techniques (just to name a few) can be implemented with clients on their first visit and make a difference in their rehab. I was pleasantly surprised at how well the course flowed with a mixture of participants from yoga teachers, clients in pain, doctors and physios. Neil Pearson is a master!" "Combining pain science with practical application in yoga helped change how I approach my clients. The course gave me tangible tools to use immediately, in a format, that allowed me to choose how to approach each situation and client differently without the feeling that I have to practice yoga to help people in pain. I think that increased pain education and the basic skills of breathing should be added to the current Canadian Physiotherapy curriculum." "You don't know me, but you have really transformed things for me. I am a patient of an MD you know in Vancouver. I have neurogenic TOS and have been doing everything I can to manage my condition as I am a university professor, who prior to developing pain had an active life working, play violin, swimming and weightlifting. Due to pain I went from doing everything to nothing and have been eager to get back to a well-balanced something. While all my treatments have helped, I wanted to learn more about pain management. I came across your three-part webcast and I was transfixed. I feel I now understand more fully the role of my CNS in my pain and why my muscles keep tightening despite the fact that my body is not in danger. Prior to this I just could not understand why medical injections could have worked if it was not actual damage. In the last week, using what I have learned from you, my pain has dropped considerably and I feel far more in control. I have passed your webinar on to others and they have found it helpful as well." "Please accept this letter as confirmation of the high quality of education provided by Neil Pearson. Neil is a gifted teacher, able to explain challenging concepts with a combination of humour and compassion. He is a role model for so many all over the world. Chronic pain is such a complex and difficult problem yet people leave Neil’s classes with a sense of optimism and hope. He truly inspires people to the possibility of less pain through changing their beliefs and changing their behaviours. To know that we can change what happens to us by attitude is a gift and he gives all who meet him that gift in an empathetic manner. Neil provides a unique experience for his students. I would highly recommend that anyone with chronic pain and anyone teaching Yoga to people with chronic pain learn from him. It will be a life changing opportunity for sure. Having been a witness to Neil’s wonderful work and crystal clear method of teaching and motivation, I highly recommend him as a truly humane being. Yours in yoga."